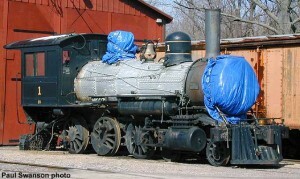 #1 in April 2000, awaiting boiler work. Paul Swanson photo. 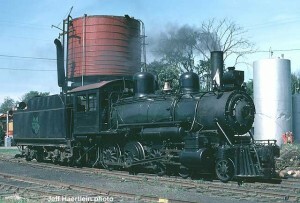 WC&C #1 was built by the Montreal Locomotive Co. in Canada, in 1913, for coal hauling service at Beaver Mines, Alberta. WC&C later became Royalties Oil & Share Corp., and eventually merged with Lethbridge Collieries, Ltd., in 1935. 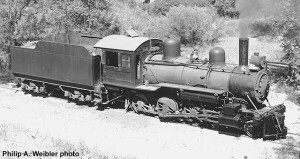 The locomotive was last used in 1964 at Plyami, Alberta. 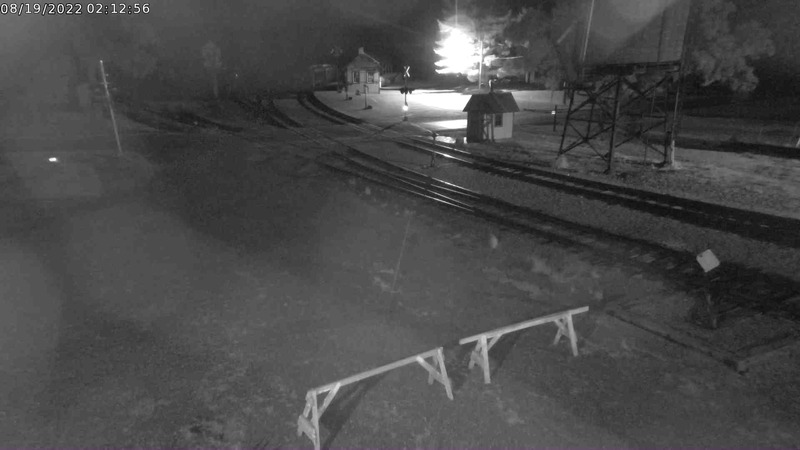 It was purchased by a group of museum members and moved to North Freedom on two flatcars, arriving at the museum on October 30, 1965. #1 in service, August 31, 1986. Paul Swanson photo. At first glance, #1 would appear a rather simple design for a locomotive of the 1910’s. 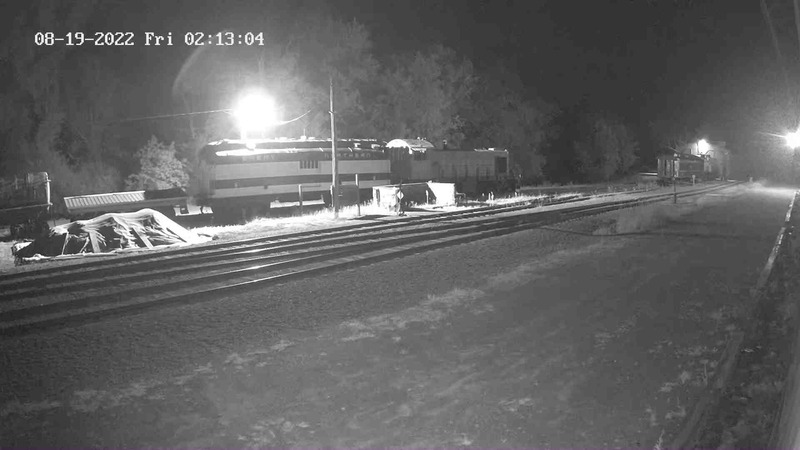 In fact, its blueprint can be traced back to a group of similar engines, albeit straight-boilered, built by the Pittsburgh Locomotive Works for various American roads as B&LE, Pittsburgh & Lake Erie, and Duluth Missabi & Northern in the late 1880’s. By the early 1900’s they became obsolete and many found their way to Canada via equipment dealers. The construction of the National Transcontinental Railway across Canada brought a need for low-speed workhorse locomotives to assist with construction. A group of about 15 engines were built by Montreal to the old Pittsburgh design. So successful they were, many copies were ordered by Canadian public and private railways, thereby saving on engineering/redesign costs. WC&C #1 is one such example. 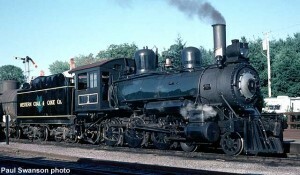 One other similar locomotive is known to still exist in Canada. 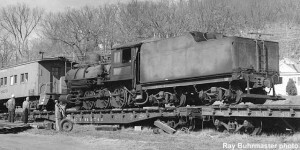 CN #1165 was displayed in Montreal at the National Museum in the late 1960s. #1 at Quartzite Lake, unlettered, c.1970. Philip A. Weibler photo. MCRM’s shop forces brought WC&C #1 back to life by 1970. She served as duty engine at the museum for many years during the 1970s and 1980s. In 1991, she received a new wooden cab. She is coal fired, weighs 55 tons in working order, and features a rare chain firedoor that challenges the scoop shovel skills of Mid-Continent firemen. WC&C #1 is presently out of service, and receiving a rebuild by the museum’s shop forces, including major repairs to the boiler shell and running gear. #1 at North Freedom, c.1970. Philip A. Weibler photo. Thanks to Stan Mailer for historical information. Unloading from flatcar at North Frreedom, just after arrival at the museum, October 31, 1965.